The 2016 PBA Commissioner’s Cup’s race for the playoffs got more heated up with Bgy. Ginebra and Meralco winning last night. The Bolts further strengthened their hold on the top spot and virtually assured themselves of AT LEAST a playoff for a twice-to-beat edge in the quarterfinals. Meanwhile, Ginebra’s victory over SMB pushed the Gin Kings straight into the next round and put them in a position to fight for a twice-to-beat advantage. The No.1 seed Meralco Bolts unleashed a huge run in the closing minutes of the game to notch a 94-86 comeback win over Mahindra Enforcer in OPPO PBA Commmissioner’s Cup Sunday at SMART-Araneta Coliseum. Down 86-81 with 3:39 left, Meralco sank one huge basket after another down the stretch and scored 13 unanswered points to grab the win. Cliff Hodge delivered 25 points and 11 rebounds to spark the Bolts, who rallied from a double-digit deficit to win their third straight game and improve to 7-2, still the league’s best record. Arinze Onuaku added 16 points and 17 boards, while Chris Newsome also had 15 and seven. Augustus Gilchrist led Mahindra with 20 points and 13 boards as the Enforcers dropped to 4-5 and took a step back in their playoff hopes. The Barangay Ginebra San Miguel annihilated sister team San Miguel Beermen en route to a 110-84 victory in the OPPO PBA Commissioner’s Cup Sunday at SMART-Araneta Coliseum. With the win, Ginebra (6-4), kept its chase for a top two spot alive at the expense of San Miguel (5-3), which slid in the team standings after ending its two-game win streak. The No.1 (now held by Meralco) and No.2 seeds at the end of the eliminations are guaranteed of a twice-to-beat advantage in the quarterfinals. Import Othyus Jeffers piled up 22 points and 13 boards, while Chris Ellis came up big with 15 points and seven boards. 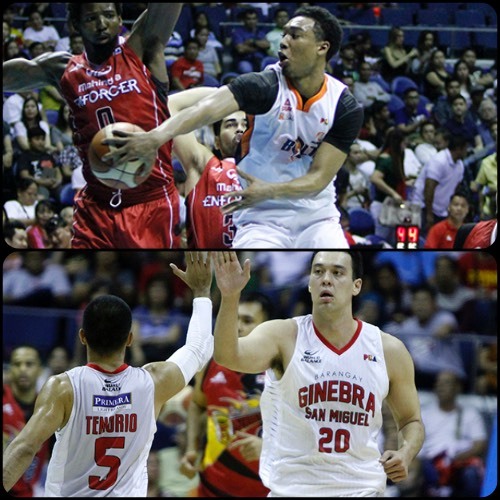 Greg Slaughter also finished with 18 points and seven rebounds. San Miguel’s explosive import Tyler Wilkerson came up with a relatively subpar scoring performance, making 20 points to go along with 16 boards. The Beermen couldn’t avoid the loss despite welcoming back stars June Mar Fajardo (14 points, 10 rebounds) and Arwind Santos (six points, three rebounds), who had been absent in their recent outings.